Clint Dempsey's poor form for club(s) and country in recent months seems to have made him angrier than usual and the testicles of Toronto defender Mark Bloom found this out the painful way. Toronto's prized new scorer Jermain Defoe immediately showed up Dempsey by scoring twice in the first 25 minutes of his MLS debut in front of 38,441 Sounders fans. Meanwhile, Seattle and U.S. national team captain Dempsey decided to take his frustrations out on Bloom's crotch with a casual slap. With that out of his system, Dempsey scored his first goal since October of last year, ending a 14-match scoring drought comprised of appearances for Seattle, Fulham and the USA. So maybe slapping opponents in the balls will become a new good luck ritual for him. 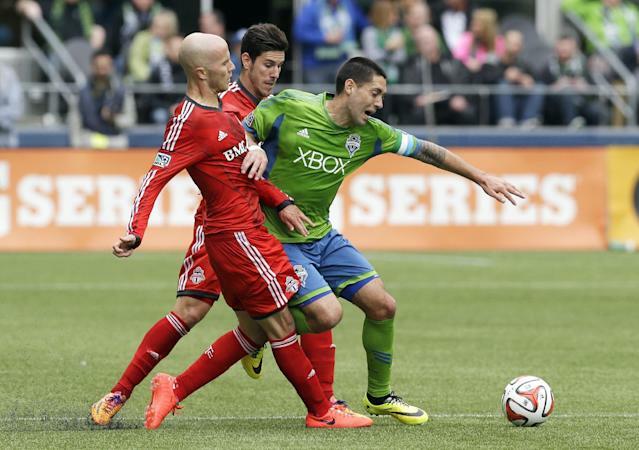 Dempsey's lone goal wasn't enough though, and the revamped Toronto FC won 2-1.